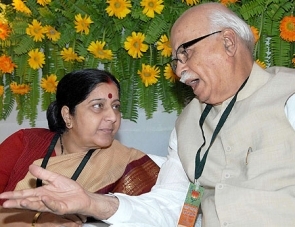 Taking strong objection to Rahul Gandhi's remarks on the treatment meted out to Bharatiya Janata Party veteran L K Advani by the party, senior BJP leader Sushma Swaraj on Saturday asked the Congress president to maintain "some decorum" in his comments. Gandhi on Friday had accused Prime Minister Narendra Modi of humiliating Advani, saying disrespecting one's guru is not Hindu culture. Addressing a poll rally at Chandrapur in Maharashtra, Gandhi had said, "BJP talks of Hinduism. In Hinduism, guru is supreme. It talks of guru-shishya tradition. Who is Modi's guru? Advani. Joota maar ke stage se utara (Advani was kicked out from stage)." Taking strong objection to Gandhi's remarks, Swaraj tweeted: "Rahulji - Advani ji is our father figure. Your words have hurt us deeply. Please try to maintain some decorum of your speech." Gandhi's swipe at Modi over the treatment meted out to Advani follows the BJP patriarch's blog published on April 4 where he said the BJP never considered its political adversaries as anti-national. The Congress chief's remark was a veiled reference to Advani not getting Lok Sabha poll ticket from Gandhinagar, from where the BJP has fielded party president Amit Shah instead.